Our Camping is pleased to present you the new Mobile-Homes lakeview, the new addition to the Summer season 2016. 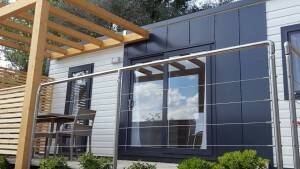 The Suite Superior are a new type of Mobile-Homes that will make your stay even more special. They are located lakeview in an unique and breathtaking placement. Within the Suite Superior you will find five beds, allocated between two bedrooms and a sofa bed. Each room is provided with a bathroom that has hydromassage shower that will give you a complete relax. The Suite Superior face a large terrace where you will be able to enjoy the amazing view of the Lake Garda during the enchanting sunset. Another addiction to our service is the internet connection‘s extention. This year you will be able to access to the wifi directly from your rooms, you can use the internet TV and listen to all your favorite songs on Youtube or keep up with your favorite TV series. Every room of the Suite Superior is furnished with all comforts, from the stronboxes where you can store your values, to our air conditioning system that will lets you enjoy cool breezes even during the hottest days. During the Winter you can benefit (from) the heating. 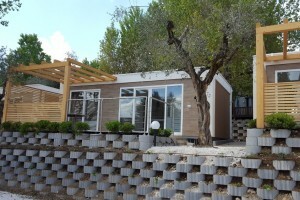 This year Camping delle Rose launches also the new Mobile-Homes Confort. The Mobile-Homes Confort are the perfetct solution for families or groups of six people. They are furnished with two bedrooms and a double sofa couch, a big bathroom that is provided with a bidet and a large terrace. You will be able to enjoy a lot of comforts, from the internet connection to the air conditioning or the heating. 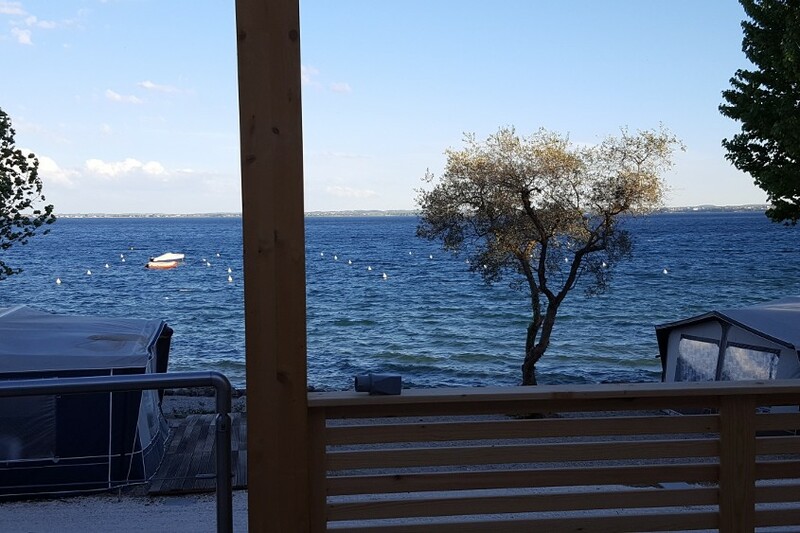 Camping delle Rose in Moniga del Garda offers its client, beside the Mobile-Homes, also a salt water pool, free wifi, a boat slip and finally an expansive beach. From this season you will find on the beach our newly restyled kiosk, where you will be able to enjoy a romantic appetizer directly on the Lake Garda’s shore. Our costumers will be able to choose between different types of holiday, families with children will have the opportunity to relax thanks to the pool hydromassage which is located nearby a polyvalent sport camp where kids will be able to have fun playing different games. If you love walks you will be welcomed by a wonderful panoramic avenue, you will enjoy our flourished oleandres during suggestive walks on the shores overlooking the Lake Garda. Make the best out of your stay at Camping Delle Rose! Don’t miss the interesting events that will take place at Lake Garda. During the first days of June at Moniga’s Castle, nearby our Camping Delle Rose, there will be the Chiaretto Party, Italy’s major event devoted to rosé wines. The Chiaretto Party will take place during the octave edition of “Italia In Rosa”. From July 23 to September 3 Salò will host the 58^edition of the International Violin Festival “Gasparo da Salò“, one of the most prestigious musical demostration of the Lake Garda. The Festival will be animated by established artists, among who, Sergej Krylov, Paolo Fresu e Luca Stradi­vari. From May to September 11, Riva Del Garda‘s squares and parks will become the stage of the versatile exhibition “Apparizioni” which will give space to music, art, poetry and dance. As every year, each Wednesday from June 15 to September 14 Desenzano Del Garda will host “Notti Bianche“, an initiative that animates the Historic Centre and promotes different activities, such as musical events. Also, during “Notti Bianche” all shops will stay open until 11 pm. All sports lover will be glad to know that between August 26 and September 4, Arco will host the “Rock Master Festival”, during this event all the best climbers will challenge each others. We hope you will choose the Lake Garda for your holiday destination, here we leave you our Camping delle Rose‘s aerial view. We also suggest you to check out the last availability and we invite you to book the best solution for the upcoming Summer Season as soon as possible.